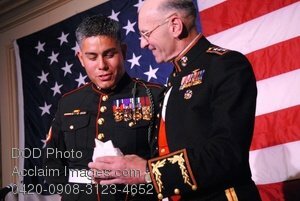 Description: Free, public domain image: Marine Corps General Presenting an Award to a Staff Sgt. 090325-A-7377C-009 - Marine Staff Sgt. Joseph Perez, left, is presented a United Service Organizations of Metropolitan Washington Special Salute award by Marine Lt. Gen. Duane Thiessen, the deputy commandant of the Marine Corps for programs and resources, March 25, 2009, during the USO-Metro 27th Annual awards dinner at the Ritz Carlton Hotel in Arlington, Va.